Sign in to access professional-only pricing and shop. 1st time visitor? Register your SalonCentric account, exclusively for salon professionals. Please check your email for a secure link to complete your registration. If you do not receive an email within 30 minutes, please check your spam folder or contact Customer Care at 1-877-250-9215. Provide your email to receive a link and verify your account. If you receive emails from us, you can register to shop online using the same email address. This email could also be the email that you’ve given to a Store Associate. If you enter a valid email address and it matches our records, you will receive an email shortly with a link that will verify your identity and allow you to finish the registration process. Tip: Your SalonCentric account number is on your shipping invoice next to “Sold To” or your store receipt next to “Customer”. Your zip code is the 5 digit number from your permanent ship-to address on file. Please contact Customer Care at 1-877-250-9215. We’ll be happy to assist you. SalonCentric does not ship to the following states: AK, AR, HI, KY (select areas), MO, MT, NM, OK, TX. 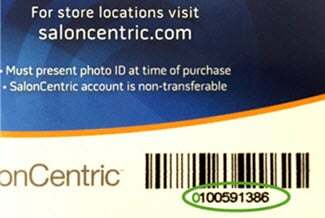 If you have a new SalonCentric store card, enter 0 and then the 9 digit number on your card. If you have an original store card, just enter the card number with no leading 0’s. Online shopping is now available in all areas!